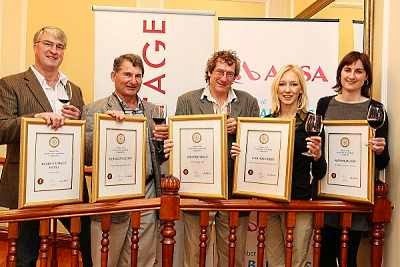 The winners of the Perold Absa Cape Blend Competition were announced on Friday 5 September 2014 at the Taj Hotel, in Cape Town by De Wet Viljoen, Deputy Chairman of the Pinotage Association. A total of 41 wines from 33 producers were entered. “The exciting thing about the Cape Blend wine category - besides it being uniquely South African - is the diversity if offers,” said Beyers Truter, Chaiiman of The Pinotage Association. “Apart from the borders drawn by the prescribed Pinotage component, the winemaker basically has a clean slate with which to work, causing a category that is as diverse as it is innovative. According to Craig Bond, Chief Executive of Business and Retail Banking at Barclays Africa, Pinotage and the Cape Blend category of wines are truly unique jewels in the crown that is the South African wine industry. “This partnership reflects our long-standing commitment not only to the Pinotage Association but to the South African wine industry as a whole. Our corporate philosophy is strongly centred around ideas, innovation and creativity, and the Cape Blend winemakers reflect these values with their dynamic and passionate search for wines that have an own identity, are creatively put together and reflect the excellence of Brand South Africa, of which we as a bank are proud to be a part of." From left to right: Andries Blake (Blakes), Danie Steytler (Kaapzicht), Jeremy Borg (Painted Wolf), Suzanne Coetzee (Clos Malverne), Rolanie Lotz (Rheboksloof).